Tennis is one of the biggest sports in the world, in terms of the number of players, professional tournaments, fans and betting opportunities. Before we give you free tennis betting tips here is a little bit of a history of the sport we all love. The sport of tennis as we know and love today descended from Real Tennis and originally, the ball was struck with the palm of the hand. It wasn’t until the 16th century that rackets came into use and tennis was very popular in England and France. Interestingly, many of the original tennis courts have survived and can be seen in England and Scotland, where Mary Queen of Scots regularly played. The sport has developed a long way since then and there is huge prize money to be won on both the men’s and women’s professional tours. Gambling has been closely associated with tennis, even from the early years and free tennis predictions and tennis 1x2 betting tips for today are commonly searched phrases on the internet. There are many tennis matches taking place around the world and you could almost place a bet on tennis every day of the year. Share your tennis tips with the Tipster community! Tennis is a racket and ball sport which is played between two or four people. Singles tennis is the most popular form of the game and takes place on a tennis court, which is split down the middle with a net. The aim of the game is to get the ball to bounce twice on your opponents’ side or beat them with a shot so the ball travels beyond them. The points system used can seem quite complicated to first-time players with each point won adding to the players total as follows: 15, 30, 40 and game. If players are level on 40 points, Deuce is called and a player must win by two clear points to take the game. Tennis is played across the best of 5 sets for men and 3 sets for women. The first player to reach 6 games wins the set and if the set is level on 6-6, either the first player to win two games consecutively will win the set or it will go to a tie-break. Players take it in turns to serve from one game to the next, as the server always has an advantage as they can send the ball down to their opponent using an overhead shot. A player has two chances to get their serve in play or the point is awarded to the non-server. Tennis is often a very fast paced game and can be played on different surfaces including grass, clay and hard court. Players tend to favour one surface over another and this must be considered when making tennis betting tips. There are four big tennis tournaments each year and these are known as the Grand Slams. The four Grand Slams are the Australian Open, French Open, Wimbledon and US Open. They are played in that order each year, with the Australian Open in January and US Open in September. You will find many tennis betting tips for free at JohnnyBet prior and during the Grand Slam tournaments. As highlighted above, some players prefer to play on specific surfaces and a great example of this is Rafael Nadal. The Spaniard is a world-class tennis player and has won all four of the Grand Slam titles. However, of his 16 Grand Slam wins to date, 10 of them have come at the French Open, which features Nadal’s preferred surface of the clay. However, on the rare occasion you will find someone special, who can perform consistently across many playing surfaces and Serena Williams is a great example. The American has won 23 Grand Slam titles to date and these have been split between all four tournaments, with 7 coming in Australia, 3 in the French Open, 7 at Wimbledon and 6 at the US Open. While the causal tennis punter will look for free tennis predictions 1x2 around these big tennis events, more experienced tennis gamblers bet on the ATP Tour, WTA Tour, Challenger Tour and ITF Tour. Having read through to this section of the article, you already have one thing to look for when betting on tennis and that’s the playing surface. You can use this knowledge to your advantage when deciding on which player to bet. There are a wealth of statistics available on the internet and you can use these to help make judgements when betting on tennis. Which players have been in good form? Who has suffered a dip? Has a player been carrying an injury? Remember, tennis is a sport competed by individuals who meet each quite often in tournaments, thus producing a head-to-head record. Always check to see if one player is dominant over another before placing a bet. In-play tennis betting 1x2 has become very popular and if you can identify players who perform well in pressure situations, you can use that knowledge to your advantage. Some players react well when they are behind and others struggle to close out match points. Finally, always take advantage of tennis betting tips, especially when they come free. You do not always have to accept them but they can confirm or contradict your bet before you make it. Check out also our article about other sure betting predictions . Bet on tennis tournaments with Bet365! Here at JohnnyBet, we have a range of top free tennis 1x2 betting predictions daily and other sure betting tips . A community of high-quality tipsters provide tennis betting tips for free and you can start using them and the additional advice on the website to make some money betting on tennis. 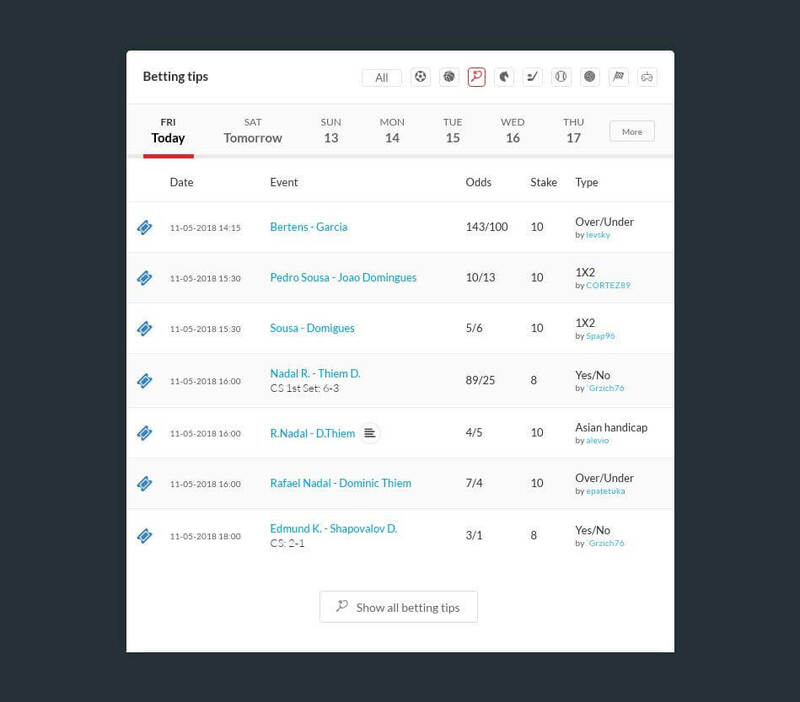 You do not need to be an expert, as the tipsters are here to do all the work for you and you can follow the discussion ahead of the match before placing your tennis bet. The best way to find today's tennis betting tips is to head over to the JohnnyBet Tipsters League. Here you will discover all the finest online tennis betting tipsters and when they are correct in their tennis predictions for today, they are rewarded. Using the JohnnyBet Tipsters League you can exchange information with other punters and increase the number of your winning tennis bets. The leading tipsters gain a great reputation in the community and there is a monthly prize pot of €2000 available for the most successful tipsters. So, what are you waiting for? Get in on the JohnnyBet Tipsters League today and start making the most of tennis betting tips for free.